Brown's Gymnastics Center is packed with many talented gymnasts. This page will highlight a few of them. 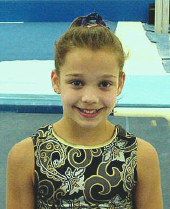 Meagan Rebecca Browning, born January 8, 1988 is only thirteen years old. Meagan is a sensational elite gymnast who trains with Nina . She is training very hard and has displayed great talent and incredible skills. Meagan's favorite events are bars and floor. She is a very dedicated athlete who is working some exciting skills such as her double layout full out bars dismount. Expect to hear more about Meagan, she is a very skilled gymnast. Susan is fourteen years old and has been training alongside Nina for several years. She is young, but already famous for her signature move, the backheadspring. Susan was born on April 6th, 1987 and is the youngest child in her family. When she has any free time on her hands, Susan enjoys surfing the internet, diving, trampoline, shopping, watching tv, dancing, and making bead. Susan is already a star - look forward to hearing more about her in the future.